Some things are just cuter when they’re smaller. Kitties. Baby things. Re-ment miniatures. Does it apply to donuts? 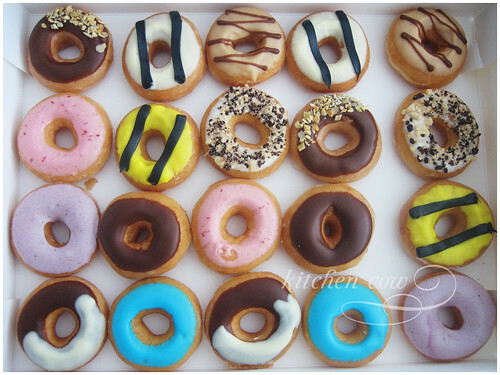 When we’re talking Krispy Kremes, they are! I was surprised to see a box of Krispy Kremes waiting on my office desk yesterday. I was even more surprised when I opened the box and saw the cutest doughnuts ever! Dubbed Krispy Kreme Minis, these are much smaller than your normal doughnuts. 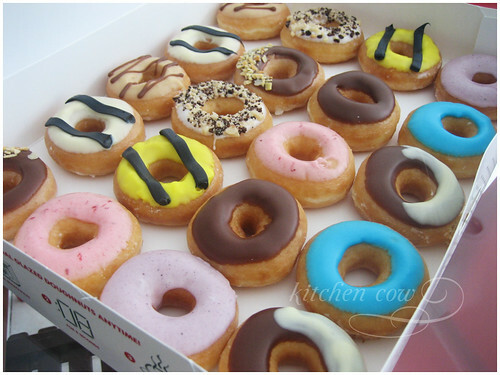 These fried glazed mini-doughnuts come topped with an assortment of colorful flavored frostings. Despite the small sizes, these little babies don’t hold back on flavor and deliver the mouthwatering yum factor we keep coming back to Krispy Kremes for. I was too busy eating, I forgot to take a comparison shot. But think of it this way—this is the same box they use for a dozen doughnuts. Personally, I think these new sizes are made of awesome. At times, I get tired of a single flavor easily, especially when they’re on the sweet side. One of the main reasons why Original Glazed is still my favorite. But with the minis, you finish eating before taste fatigue sets in. Plus, you get to try a variety of flavors—from the chocolatey, to the peanut buttery to the fruity creams. Made of win all around, I’m sure you’d agree with me. Krispy Kreme Minis come in boxes of 20 at 299 per box. Perfect for sharing, or for hoarding. Depends on your mood, I guess. This entry was posted in food spotlight, restos & eateries. Bookmark the permalink. Those are fried donuts? Really? I thought KK were baked ones. I’m usually scared to try anything other than the original glazed. I love the mini donuts! Di nakakaumay. As far as I know, they have two kinds. The original loops which are fried and the cake-type ones which are baked. Oh, and the filled ones but I’m not sure if they’re fried or baked. Personally, I like the fried loops. Ebil but nyummy. Thinking of using them as a wedding favour and need to see if we can find a box to fit! Not sure about the actual size since I wasn’t able to measure them, but for reference, the box they use is the same box for the dozen donuts. So comparatively, 3 full-sized donuts = 4 minis? Sorry can’t be of much help.